What is the best budget action cam? What is the best small waterproof camcorder? Which one is the best choice under 100$? Which one has wifi, gps or the remote control? Which have a good video quality even in low light? In this article we try to find out what is the best choice among the many action cams on the market, describing the video quality, photographic quality, features, functionality, advantages and disadvantages, to help you to choose the best action camera that fits your needs. In fact, as we will see, there’s not the perfect action cam out there, but you should choose the best one for your needs and your pockets. In 2017/18 were presented a lot of 4K@30fps action cams, so we will analyze them and 2k cameras and then 1080p cameras for every need and price. This article is often updated, last update on 2018, June 28. We made a list of the best action cams on the market, with their characteristics, such as the presence of the wifi, gps, stabilizer, weather they’re waterproof , video and photo resolutions, if they have GPS, bluetooth and wifi, and a remote controller, the quality of videos and pictures shot, even in low light conditions. With this comparison you can have a better idea of what’s out there and make a more informed choice. After the tabs you will find some impressions, videos, comparisons on the action cam described, with some of ours and other users’ opinions. The action cams we compared are: GoPro Hero 5 and 6, Xiaomi Yi 4K and 4k plus, Firefly 8s, Gitup Git2, Sjcam SJ7, Sony X1000V, Xiaomi Yi, Garmin Virb, Drift Ghost-S. The brand new GoPro Hero 6 Black has many features in common with gopro 5 like a 2″ touch display, electronic stabilization, GPS, it is waterproof up to 10m without case, voice control, and a new “Remo” waterproof remote control. But regarding video resolutions, it can record 4k@60fps videos, and can shoot 12MP photos and it uses a proprietary chip – while Gopro 4 mounts Ambarella A12 – and it’s the best hardware out there, expecially whan we talk about stabilization. It costs 529$. It can record videos with many resolutions, 4K@60/30fps , 2K@60fps, 1080p@120fps, 720p@240fps perfect for 6x slow motions. Pictures have a 12MP resolution. It has a big 2″ touchscreen display, where you can see what you are recording or shooting, change options and features, and playback videos. Menu is very easy to use. There are 9 functions: Photo, Photo timelapse, Photo timer, Continuous shot, Video, Video timelapse, Slowmotion video, Loop video, Video + timelapse photo. HERO6 Black is waterproof to 33ft (10m) without the need of a housing. If you need to go deeper, there will be a new underwater case for diving for up to 60m / 196ft. It features voice control, 12 commands to start / stop video, shoot a photo, change options etc. just using your voice. It has GPS to geo localize your pictures and videos. Gopro 5 can shoot RAW photos. RAW photos provide the most flexibility when using advanced photo editing software. WDR photo mode captures both added detail in shadows and highlights in the scene. It features a 1160mAh battery that promises to record up to 100 minutes at the maximum 4k@30fps resolution, and above all a 6-axys Gyro stabilizer that removes vibrations and undesired movements using a gyroscope and a accelerometer, and is much better than GoPro 5. Talking about the audio, Gopro 5 has 3 microphones for a superior stereo audio quality and can use an external USB-C microphone. GoPro 6 features an excellent hardware and every functionality you can imagine on a action cam: 4k@60fps, touchscreen LCD display, excellent gyro stabilizer (much better than GoPro 5), bluetooth remote control, GPS, voice control. With brand new chip, waterproof shell, 3 microphones, 4k@60fps it is probably the best choice for professionals and amateurs. The brand new Xiaomi Yi 4k has the same video resolutions than GoPro 4 black, max 4k @ 30fps, and it uses the new Ambarella A9SE chip – while Gopro 4 mounts the older A9 – and the new performing 12MPSony IMX377 sensor with a dimension of 1/2.3″ so it”s the best hardware out there. It can record videos with many resolutions, 4K@30fps , 2K@60fps, 1080p@120fps, 720p@240fps perfect for 6x slow motions. Pictures have a 12MP resolution. It has a big 2.19″ touchscreen display, where you can see what you are recording or shooting, change options and features, and playback videos. Menu is very easy to use. There are 9 functions: Photo, Photo timelapse, Photo timer, Continuous shot, Video, Video timelapse, Slowmotion video, Loop video, Video + timelapse photo. Xiaomi Yi 2 is on pre-sale at Gearbest right now at 249$, the best price of the web. But if you use the coupon code YI4KIT you will pay it just 199$. Xiaomi Yi 4K features an excellent hardware and every functionality you can imagine on a action cam: 4k@30fps, touchscreen LCD display, gyro stabilizer, bluetooth remote control. With brand new Ambarella A975SE chip and Sony IMX377 sensor, this action cam can really be the GoPro 4 killer, and it costs less than half the price of the GoPro 4. Recommended for: high quality 4K video action cam with a good gyro stabilizer, touchscreen, bluetooth remote control | stable and sharp videos, with good quality stereo sound. SJ7 Star can record native 4K@30fps videos – we remind you that SJ5000X and M20 record interpolated 4K videos from 2880×2160 resolution to 3840×2160 – and 1080p@120fps, being equipped with 12MP Sony IMX117 sensor, the same used by GoPro in the Hero 4 black, and with Ambarella A12 chip and features a 166° Wide-angle Lens, f=3mm, F/2.5 aperture. SJ7 Star aims to appear as a premium action cam, so it has a cool and elegant design with a full metal body. As all SJcams it features a 2″ display that in this cam it is also touchscreen, a new feature for SJcam, very useful to change options and navigate in the menu, to see what you are recording and to playback videos and photos..
SJ7 star features a built-in Electronic Image Stabilizer (EIS) for smooth videos without vibrations and shaky videos. It uses a Gyro sensor combined with a Acceleration sensor to perceive and stabilize vibrations and shaking during a motion. SJ7 has built-in wifi that allows you to connect the phone to the cam using the app SJCam Zone (iOS / Android). SJCAM SJ7 Star can be controlled by a remote control, very similar to the SJCAM M20 one. Perfect when you put the cam in places you can’t reach with your hand, like the helmet, kayak, outside the car or other places. You can start/stop recording, take a picture, change mode, turn off wifi and even turn off (and on?) the cam. SJ7 can be used with an external microphone, and this is again something new for this brand. SJCam SJ7 Star features an excellent hardware and every functionality you can imagine on a action cam: 4k@30fps, touchscreen LCD display, gyro stabilizer, bluetooth remote control. With brand new Ambarella A12SE chip and Sony IMX117 sensor, this action cam can really be one of the protagonist of the 4K action cam world, and it costs way less than half the price of the GoPro 5, and 50$ less than Yi 4k. Recommended for: high quality 4K video action cam with a good gyro 6-axis stabilizer, touchscreen, bluetooth remote control | stable and sharp videos, with good quality stabilization. The Firefly 8S is the latest release among camcorders with the Sony IMX117 sensor and the Ambarella A12 chipset, which equip the best action cams of the moment, and this has given it a benefit, as designers have been able to improve their competitors’ defects and add features and functionalities. In fact, in addition to having excellent video quality like direct competitors with the same hardware, as SJ7 Star, Thieye T5e and AN7000, the Firefly 8s has a gyroscope that allows a very good 6-axis stabilization without any reduction in the visual field, and also the ability to use an external microphone. The Firefly also has the bluetooth that allows it to be controlled by a remote control such as the Yi, and a convenient threaded hole on the bottom to easily attach it to a tripod. Compared to the SJ7 it only misses the touchscreen, but you can save 60 €. This new 4K Action Cam has a very good hardware quality thanks to the Ambarella A12LS75 processor and the 12.4MP Sony IMX117 sensor that lets you record video in 4K at 30fps and 1080p @ 120fps. The quality is astonishing especially when compared to the price, overtaking the old generation of economic action cameras (SJ5000X, Firefly 7S, Git2), it also overtakes the new ones (SJ6 Legend), and it is practically at the Yi 4K level. Plus the stabilizer is more effective thanks to the presence of the gyroscope. A cam so amazing, at a really low price, with Ambarella chipset and gyroscope. The battery has surprisingly a capacity of 1200mAh, so it has a higher capacity than direct competition, which allows it to gain a few minutes of recording, and to exceed one hour and a half of recording. The field of view or FOV is 170°, then with a wide-angle fisheye, but there is also a version with FOV reduced to 90° to shoot photos and videos without distortion, but with less visual field. Firefly 8S is a great heir to Firefly 6S and 7S. Excellent video quality, up to 4K at 30fps, excellent sharp, bright 12MP photos. Excellent 6-axis electronic stabilizer thanks to gyroscope and accelerometer. Good light change management, even under difficult conditions. Rear display, optional remote, external microphone and price put it to the top among the action cams around 100€/120$. The only lack is the touch screen. 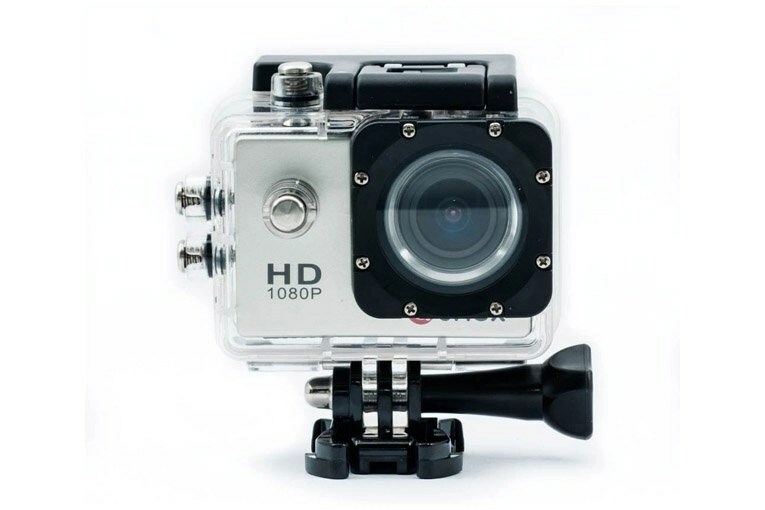 This action cam records excellent and sharp videos with natural colors, and shoots very nice photos. It really surprised me when i tested it! But what surprised me most was the stabilizer, you can see it in action in this video. AN7000 features a built-in Electronic Image Stabilizer (EIS) for smooth videos without vibrations and shaky videos. It uses a Gyro sensor combined with a Acceleration sensor to perceive and stabilize vibrations and shaking during a motion. It’s quite good, almost as effective as Git2 and SJ6 ones. AN7000 has built-in wifi that allows you to connect the phone to the cam using the Andoer Camera app (available for iOS / Android). It can be controlled by a remote control, optional and still not available (but I tested it with Yi remote and it works, you just need it to pair it with the cam). Unfortunately it can not be used with an external microphone. All of this for 126$, but with the coupon code 12AN7000 you can get it for just 113$ from Camfere. Andoer AN7000 features an excellent hardware: Chip Ambarella A12 and sensor Sony IMX117, that allows the cam to record native 4k@30fps. It features LCD display, gyro stabilizer, bluetooth remote control (you can use the YI remote). This action cam records excellent and sharp videos with natural colors, and shoots very nice photos. This is probably the best choice around 120$, the video and photo quality is much better than Git2, SJ5000X, Firefly 7s, slightly better than SJ6, and quite as good as Xiaomi Yi 4k. The stabilizer works really well. And the price is surprising: just 113$! AN8000 is exactly the same cam, same chipset, same sensor, but comes with a remote control and supports external microphone. Besides, it doesn’t have the threaded hole on the bottom. T5e has built-in wifi that allows you to connect the phone to the cam using the app ThiEYE HD (iOS / Android). T5e can be controlled by a remote control, optional and still not available (but I tested it with Yi remote and it works, you just need it to pair it with the cam). Unfortunately it can not be used with an external microphone. ThiEYE T5e features an excellent hardware: Chip Ambarella A12 and sensor Sony IMX117, that allow the cam to record native 4k@30fps. It features LCD display, gyro stabilizer, bluetooth remote control. This action cam records excellent and sharp videos with natural colors, and shoots very nice photos. This is probably the best choice around 120$, the video and photo quality is much better than Git2, SJ5000X, Firefly 7s, slightly better than SJ6, and quite as good as Xiaomi Yi 4k. And the price is surprising: just 109$! Recommended for: high quality 2K video action cam with an excellent gyro stabilizer, touchscreen, bluetooth remote control, external microphone | stable and sharp videos, with good quality stereo sound. All of this for 154$, but with the coupon code 20off you can get it for just 126$. If you buy it from gearbest, put it on the shopping cart and then use the coupon code GitUp2, price changes to 104.99$!! Positive notes of this action cam are the back 1.5″ LCD screen that allows you to see what you are recording, playback videos and photos and easily change settings, and the audio that has a very good quality. This cam records a very good sound, definitely better than other cam of the category (SJ5000X, Xiaomi etc.) almost reaching GoPro and Sony quality, but additionally it allows the use of external micro usb microphones, useful in many conditions such as. in motor bike, in which you can place the mic in a wind-sheltered spot. See eg. this microphone. Another interesting feature is the possibility to use a simple Wrist Remote Control to start and stop recording of videos or to take pictures. You can find the remote at GearBest for just 14$. One thing that makes this cam really interesting is the presence of the Gyro Stabilizer , a hardware component that stabilizes video when they could be shaky, for example during a bike session, running, or even just walking. The stabilizer works really well, although not as the Sony’s Steady Shot. It works much better than in SJ5000X and slightly beter than in Firefly 6S. Many other features are really useful to use the Git2 as a dashcam, like the Cyclic record, the Motion Detection that allows you to start recording when the cam detects movement, useful, for example on skis, by bike or motorcycle and in the car, a G-sensor useful in case of accidents, it stop deleting files in Cyclic Record mode to keep the file in wich the accident is. It also has the possibility to turn on and off the action cam when you plug in the mini usb, useful in the car. Included in the package you will find the waterproof case and many accessories and mounts. Videos are of excellent quality in good lighting conditions, good quality in the backlight and in shaded areas, decent at night. Videos have a bit rate of 29Mb/s that is quite high, although not as Gopro 4. This means that the videos are less compressed than SJ4000 ones eg. that has a 15Mb/s bit rate and than SJ5000 which has bitrate of 24Mb/s or Xiaomi Yi that has a 25Mb/s bitrate. The battery is 950 mAh and allows you to record just over an hour and twenty minutes at 1080p 30fps, but the additional batteries cost really a little, and are the same of the SJ series. There is not yet a dedicated App to control the cam via wifi, but you can use the Finalcam or FN cam Apps. This is a valid alternative to SJ5000X and FireFly 6S, they have the same chip, same Gyro stabilizzer, similar Sony sensor, same video risolutions. Git2 has a better audio quality and the possibility to use an external microphone and the wrist remote control. Also Git2 Gyro stabilizer works better than SJ and Firefly. Firefly 6S has no monitor. Here you can watch a comparative video among the 3 cam and GoPro 4. We suggest to buy Gitup git2, rather than the other 2. Excellent action cam, probably the best under 150$, records excellent interpolated 4k videos and 2k or 1080p @ 60fps videos, has an LCD screen, very useful Gyro stabilizer, excellent audio quality, wrist remote controle and a very low price. If you buy it from Gearbest, put it in the shopping cart and then use the coupon code GitUp2 to pay it 104.99$!! In the first version of this post at the end of 2015 we said this cam had a lot of problems and that it was not such a good choice, for instance the gyro wasn’t working properly, colors were reddish, audio had a very low quality, pictures were flat, reddish, dark and not sharp. With the latest firmware updates, above all the last one, v1.25, almost all these problems were nicely solved. Gyro stabilizer now works pretty well (see videos below in the article), colors are natural – good greens for the plants and intense blue for the sky – exposure changes are well managed even in back light, pictures are beautiful even in difficult lightings, shaded areas are well exposed, audio got really better (but still not excellent as git2). Besides there are a lot of new options in the menu, like the volume setting in the audio section, shutter speed and more. We can now say that SJCAM worked hard to get the best from its good hardware. So now we feel to suggest this cam, as we did for the Gitup Git2. See this comparative video SJ5000X vs Gitup Git2 vs Sony AS200V vs Elephone Explorer Pro. Very good stabilization for SJ5000x, Git2 and Sony, colors are natural, vivid, real, exposition is well managed, in shaded areas probably the best is the SJ5000X, it produces clear videos even under the trees with low light. The sharper videos seem to be the ones recorded with Sony and SJ5000X. I think the best pictures are the SJ5000X ones, they are always well lit and with vivid and natural colors, even in back light. Probably it is the best choice for action cameras under 120$ together with Gitup Git2. It has a lot of winning points, good video quality, excellent photo quality, (interpolated 4k@24fps), 2k@30fps videos, 2″ rear screen, good gyro stabilizer, a lot of accessories, a very good price (119$ from gearbest, 150$ on Amazon), many options. Probably the only defect of this cam is still the audio, low volume althought you have 3 volume levels in the menu now. This was probably the bestseller among budget action cams in the range from 50 to 80 $, now it’s a bit old and has no stabilizer, but has still a very good video quality. It combines an excellent price (69$) to a high video quality – comparable to gopro 3 silver – and also great photo quality, thanks to a 16mpx Sony Exmor R sensor, a sensor also mounted on sony action cams and some cameras. Since August 26, 2015 there is a new firmware that allows you to record in 2k at 30fps, with a bitrate of 15Mbps (perhaps a bit low, but you can increase it by script). The video quality is definitely superior to SJ4000, SJ4000+, and it is on a par with the SJ5000 +, indeed probably is superior to the latter in many conditions, especially in difficult light (with little light sometimes the quality is superior even to the GoPro 3). The only flaw is the lack of an LCD screen, an underwater case (it is optional and costs 15-20$) and accessories (if you use the cam with the case on, it is compatible with GoPro accessories). It also has wifi so you can see what you are recording on smartphones live. It also has Bluetooth and recently you can find out there a remote control from about 15$. On the internet there are simple tutorials and mods to shoot videos at 2k 30fps with 35MB/s bitrate or to manually change ISO and exposition. This action cam is positioned just below the high-end GoPro (4 Hero and 3+ Hero black and silver), and significantly above the direct competitors of the same price range, as well as the SJ4000, SJ4000+, SJ5000, Sony AS30v. Probably the video and photo quality is similar to the Sony AS200v. The videos are well defined and detailed even when enlarged, and the excellent processor working with the Sony Exmor R sensor make an excellent job even in low light conditions or in changing light / shadow conditions, managed very well without unexpected leaps of exposure. The battery is 1010mAh, and lasts about 100m recording at 1080p30. The audio is stereo and if you do not use the housing it is of average quality , but is ruined if you use the cam moving ina a motorcycle, bike or running fast. The Xiaomi Yi can be controlled via Wi-Fi with a free App , available both for Android and iOS. Here are some uncompressed video shot with the Xiaomi Yi (download it to your PC from the top menu to see the full uncompressed quality). Unfortunately the Xiaomi Yi doesn’t have a LCD screen to see what you are recording, not even a small screen to see the settings, you must then change them using the app on a phone or tablet. Another shortcoming is the lack of the waterproof case in the box, but it can be < href=”http://www.amazon.it/gp/product/B00Z5DHG5E/ref=as_li_ss_tl?ie=UTF8&camp=3370&creative=24114&creativeASIN=B00Z5DHG5E&linkCode=as2&tag=blogfotografico-21″ target = “_ blank”> purchased separately at 18 $. 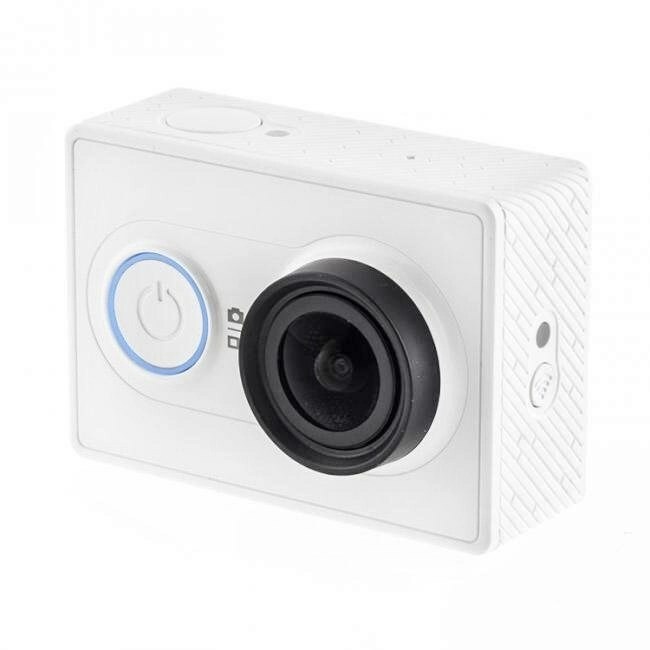 If you want to enter the world of action cam on a budget this is perhaps the best choice , the video quality is truly amazing, especially considering the price, too bad the lack of the screen but even the GoPro Hero 4 black doesn’t have one. At this price it is really a bargain, you can find it on Amazon US at 77$ or see below the links for other countries. Simply purchase the waterproof cover and some accessories to have a complete action cam. With inexpensive adapters you can use all the accessories for GoPro. Almost certainly at the moment the Xiaomi Yi is the best action cam in the economic range and the only one that allows you to record in 2k to a very low price. It also makes great pictures at 16mpx. * use coupon code XiaoMiYi to get it @Gearbest for 59$! With AS200v Sony created the ‘almost perfect’ action cam. The AS200v has a great video quality, almost unbeatable. The AS200 performs better than the AS100v and AS30v in low light , and the stabilizer works best “amortizing” even more vibrations and movements rash than the already good AS100. The video quality is much better then AS100v and AS30v if you compare the video and photo definition (especially recording in Pro Mode up to 50mb/s), and the colors, that are natural and vivid. If you want the 4K, Sony X1000v has the same characteristics of AS200v with the added option of recording in 4K. Sony AS200v has wifi and can be controlled by a smartphone or tablet using Sony’s App. It can also be used with the Live View remote control that allows you to control up to 5 Sony cams simultaneously and to see live on your wrist what you are recording , a very good option, especially if the cam is placed on the helmet or in not accessible areas, and Sony is the only one that provides this accessory – others have the remote control with 2-3 buttons to operate the cam and in which you can only see if the recording is active. The AS200 also has GPS that keeps track of your routes. Thanks to the editing program provided by Sony, you can see the route you took and visualize your path drawn directly in the video and see live where you are in the drawn path. AS200v also has the Pro Mode , which lets you record using XAVC S professional codec, with a higher bit rate up to 50mbs, which keeps better details and allows modifications without loosing quality when editing videos. (To use this mode, you need a micro sd card of at least 64GB). The Sony AS200v has excellent Zeiss optics, a CMOS sensor Exmor R for photos in 8.8mpx – real resolution -, records FullHD 1080p 60fps or 30fps videos, or 720p and 480p at 120fps to 240fps for good slowmotions. It has an excellent electronic Steadyshot stabilizer that works really well, and has been further improved from AS30 and AS100, when comparing videos made by Sony with the competitors, in certain conditions the difference is embarrassing, the Sony seem mounted on a steadycam, videos of competitors are wobbly and blurred (see this video and this ). This action camera is splashproof and waterproof in light rain conditions even without its case, allowing to shoot videos even in the rain without worrying about getting wet. To go underwater the housing is needed, which in any case is included and can be used up to 5m underwater. For shooting underwater beyond 5m there is an optional Marine custody. The Sony AS200v is sold alone at 248$ or combined with the remote control at about 348$ . In conclusion, the Sony AS200v is an action camera with a high quality video, with a very affordable price, wifi, gps, improved stability, waterproof, gives the ability to have a live remote control. In short, it has everything, and works very well, missing only the 4K resolution (see Sony X1000v).Once you have the remote control and accessories, you can use them with other Sony cams, even simultaneously, as they are also compatible with previous (AS30v, AS100v) or higher models, such as the X1000V that has the same video quality but can record 4K videos. Very good video and stabilization quality, much better than the GoPro 3+ and as good as gopro 4 Silver for video quality. Vivid, natural colors. Excellent even under changing light conditions. Outstanding stabilizer. SJ4000 wifi is an underwater camera made in China introduced with a great success at the beginning of 2014, especially among those approaching for the first time to the world of action cams with a small budget, then among young but people not only, and has allowed many users to buy a cam with less than 90$ , that had a decent video quality, a lcd screen to see what you’re recording, and a great range of accessories for virtually any use, and compatible with gopro accessories. It has also wifi, that adds the ability to control the cam by a smartphone and also watch streaming videos you are shooting or in playback . The strengths of the SJ4000 wifi are therefore the price, the rear screen, ease of use, the amount of included accessories , the waterproof case included in the price, and even after all the video quality that is pretty decent in good daylight conditions . The problems arise when you are in changing or shadowy light conditions , when the sun is in the shot for example. Also in low light does not behave well as other competitors like the Sony or the GoPro, but it remains a bit too underexposed, but actually I do not think that it is purchased for shooting indoors videos, so this is not a big problem. Colors are slightly cold – but you can correct them in post production – and are too much contrasted. This cam is therefore recommended to those who have a limited budget but still looking for a good product especially in daylight. For those who use it often and has already familiar with this world or want a better video and photo quality, you may want to look elsewhere, especially Xiaomi Yi or Sony AS200v or GoPro 3+ or 4. Pro: with just 100$ you get everything you need including accessories. Cheap, but with a decent quality. Video quality is lower than the Xiaomi Yi, that is even cheaper and record 2k videos, but the SJ4000 has a rear screen and many accessories included. Since June 2015 there is also the SJ4000+ plus, which records in 2K 30fps and in Full HD at 60fps and is sold at 135$. It uses a gyro for stabilization. After the success of the SJ4000, SJcam decided to produce a new cam providing it with quality components, such as Ambarella A7LS75 chip, also present in GoPro 3 + and Panasonic CMOS image sensor for photo . The result is a cam with a video and photographic quality definitely superior to SJ4000 but with a higher price, 50-60$ extra. Strengths of SJ5000 + are definitely the presence of a live screen, wifi and many accessories in the package , besides the fact that this action cam is compatible with GoPro accessories. It has a excellent dashcam function that records loops videos and turns on and off by itself when connected with the cigarette lighter of the car. It also has timelapse and burst mode. Videos shots with the SJ5000+ are sharper than those with SJ4000, with more vivid and natural colors. But what distinguishes it most from SJ4000 is the photo quality, with pictures in real 16mpx, much more beautiful than those taken with the SJ4000 at 3,5mpx interpolated at 12mpx, this is possible thanks to the excellent Panasonic photo sensor of the SJ5000+. There are also two other cheaper versions: SJ5000 and SJ5000 wifi , which are not PLUS and there are the same components of the SJ4000, as a Novatek chip that is much cheaper and less powerful, so we not recommend them. Sony AS20 and AS30v are two excellent action cams, replaced by AS100v and AS200v, therefore sold at a great price, from € 140 (AS20) to € 170 (AS30). The video quality of the two is really good and similar to the AS100v, which costs around 100 € more. The AS30 performs better in the low light than the AS20, and slightly worse than the AS100. We personally like more the look of AS30 between all three, the videos are ready for publication without editing with natural colors, while those of AS100 are too neutral, almost dull, and need editing in postproduction (see this video ). AS30 and AS20 are both wireless action cams and can be controlled by smartphones or tablet with Sony’s App. Can also be used with the Live View remote control, that allows you to control up to 5 Sony cams simultaneously and see live what you are recording , a great thing especially if the cam is placed on the helmet or in not accessible areas, and Sony is the only one which provides a waterproof remote control with this possibility. The AS30 has also GPS that keeps track of our routes and shows them on the videos, if you like. Both have Zeiss optics, a good quality CMOS Exmor R sensor for photos with 11,9mpx, they record FullHD videos, 1080p 60fps or 30fps , and 720p 120fps for slow-motion. Both have the Steadyshot electronic stabilizer that works really well. When we compare videos shots with Sony action cams with the others brands, under certain conditions the difference is obvious and embarrassing, Sony seem mounted on a Steadycam, the others are wobbly and blurred (see this video, this and this: Garmin virB vs Sony AS30v ). These Sony have quite high bit rates for movies, up to 28MB / s average in higher quality. To go underwater is required the included waterproof case, useful up to 5m. The battery is 1240mAh, and shots for about 2 hours without wifi, 1.5 h with wifi and gps. The audio is stereo and if you do not use the case it has a good quality . You can also connect an external microphone. Sony HDR-AS30V and AS20 can be controlled via Wi-Fi with the free software PlayMemories Mobile , available for Android and iOS. Here you will find a uncompressed video shot with AS30v (download it to your pc from the top menu). They are 2 cameras with a high-quality video recording, with a very affordable price, wifi, gps, stabilization, possibility to use a live view remote. They have almost everything needed, except the 2k or 4K. Once you have the remote control and other accessories, you can use them with other Sony action cams, in case in the future you want to upgrade to better models, eg. AS200v or X1000V that shots 4K videos. Read our Sony AS30v review. 2 really good action cams with stabilization and good video quality. They are quite cheap. These are old models, but still working fine. Video quality is better then SJ4000 but slightly worse than Xiaomi Yi and Sony AS200v. GoPro Hero 3 + Black Edition does not need any introduction. It’s been the reference action cam of the last two years despite the exorbitant price. Its success is due to a massive direct and indirect advertising campaign and to the resulting popularity among sportsmen and also to its indisputable video quality . With such a high price you would expect at least the electronic stabilizer, or GPS, or a good amount of standard equipment. Instead it comes with minimum accessories, and original ones cost a lot. GoPro does very well both in daylight conditions, and in shadowy conditions , not bad even in low light, but the Sony AS200v can be even better. It shoots 12mpx good quality pictures , and it has nice features as time-lapse and burst mode, to take from 3 to 10 photos in one second. The audio is good but it is mono , while Sony for example have stereo audio. Basically you pay more than the competitors, and it is because of the higher resolution (4k comes at 15fps which is unusable due to the low frame rate, but you can use the 2.7k at 30fps) and of its popularity, which also implies a good resale value of used products. It has wifi with a good app. Doesn’t have a rear lcd screen to see what you are recording, but you can use your smartphone via wifi. If you do not have budget problems can be a good choice, but if you have problems to spend so much money and not interested in resolutions higher than FullHD 1080p, you can look elsewhere, especially the Sony AS200v and Xiaomi Yi. With the money you save you can buy a lot of accessories. We will continue to update this article whenever there will be a new interesting action cam to be included in the list, so we ask you to tell us your favorites in the comments. Here we show you some interesting videos of comparative between 2 or more action cam included in our list (if you have other interesting videos link it in comments) – obviously the quality of youtube does not do justice to this cams, but can be used to get an idea. Do you have a different cam action from these showed in the article and you want to advise other members? Write it below in the comments and in the future we will add it, if possible. You have one of these cameras and you want to report a value, a defect, a feature not mentioned in the article? Report it in the comments! Previous : UMIDIGI A1 Pro, Best Entry-level Smartphone Announced! You have written YI has no image stbailisation, whereas the sj4000+ 2k has gyro, and then in conclusion you dont mention cons of YI as having no stabilisation, whereas you mention this as con in sj4000+. Thanks for writing. Actually I didn’t do the SJ4000+ review, but the SJ4000 wifi review. That’s why i didn’t mention the gyro. You’re right, i forgot to put the absence of stabilization in the Yi cons, but i mentioned it on the review, as you said. I forgot to put it also into SJ5000+ cons. Now i fixed both reviews and added a small pro-cons table for the SJ4000+. You should add the new sony AS50 – new menu, new lens, better stabilization, better buttons layout, comes w/ included underwater case. I will as soon as I can, thanks for the advice! what about sjcam sj5000 & M10 & M10+ & M20 ? i am a night diver which cam you recommended for me within 100$ to 150$ ? M10+ and M20 are very good cams, but i didn’t test them personally so i can’t judge them properly. I would recommend SJ5000X or Gitup Git2, very good cams. Great review! Im really new to this, but this review really helped and now im in between the Sony AS200V & GoPro4 Black. I prefer quality regardless of price difference. Thanks you sir! Happy to help! Good choice, but if you don’t need it soon, you can wait to see if the Xiaomi Yi 4k is a good choice too. SJ5000x elite vs M20. Which one should I get? I suggest SJ5000x upto now. Because M20 firmware is not yet so good. But M20 is a good camera too. Out of the SJ5000x elite and the GitUp Git2, which camera would you prefer and why? I’m struggling to pick between them. I’d be mainly using them to record a bit of sport and travel. Sj5000x elite or Yi 4k? Thank you. Sj5000+ or sj m20 or Xiaomi yr? Which one I must buy? Which one is better? Yi 4K or Sony AS200V? And how about Yi 4K or GoPro Hero 4 Silver regardless of price difference? I really confuse to choose the best one for me. I love photography and videography. Really need your help. Thank you Sir! Love your review. I would buy the Yi 4k, with no doubt. Hi, fo photos i would buy one with the screen, so no the Yi. M20 or SJ5000X have quite the same quality, M20 has the remote and slightly better audio, but a different shape. I like a lot SJ5000X but has a very bad audio. well we would be relying on the app since we will be using it mostly for selfie like photos and will be using the monopod alot so screen would not be an issue for us. So brush it aside would you still go for the sh5000x? I think I want the Xiaomi Yi 4K but the link to gear best doesn’t ship to Australia. Where is the cheapest place to buy online that will ship to Australia? Sorry for that. You can try Banggood (find the link above in the article) or geekbuying. lastly, good or better battery available as accessory. Hi, at first thanks for the many reviews. I would like to buy a camera especially for the pictures (underwater too). Should I buy the Yi 2 4k or the new sj7? There are not too much comparing shots between these two cameras. Hi, SJ7 is still on presle, so there are not videos out yet. I think Yi 4k will be better for videos, it has a better chip (ambarella A9 vs ambarella A12). About pictures, Yi2 has Sony IMX377 , while SJ7 has IMX117, and so YI4k should be better. I would like to buy a camera especially for the pictures (underwater too). Should I buy the Yi 2 4k or the new sj7 or eken h8r? There are not too much comparing shots between these three cameras. Look like sj5000x video quality its so much better than gitup 2 is it true? Confused between Git2 and Firefly 7s. Gyro is best in Git2 but the quality of images are dulled and not that bright as in the Firefly 7s. Which one would you recommend for motorcycles travelling? I need one to my quadcopter. Git2 and Firefly 7s are good choices? Should i consider another one? About prices, U$71 on firefly S7 is a good price? Almost forget, thanks for the reviews. 1. You will stuck with fisheye recording : there is NO fov options to correct the lens distortion. 2. Watch out your car: Tends to get very hot, so do not leave it running in in sunny day. 4. Waterproof case easily broken. 5. with so much problems the camera will not survive long enough, or will fail in action and you will lose the moment. 6. Andoer C5 Pro camera is H.264 Profile Level 5.1 , and do not have these problems, with the same price. I’m thinking about: Git2, SJ6 Legend, SJ7 Star, Yi 2. Which one would you reccommend based on stabilization (most important!) and photo/video quality? Oh, and I’m not planning to use 4K, 1080 is enough. Hi, if you don’t want 4K as you said later I would suggest SJ6. Good stabilizer (almost as git2), very good image and video quality. Maybe SJ7 star will be better but i still didn’t test it. Yi 4k is slightly better than SJ6 for video quality (not so much actually), but not for stabilization. Just i wouldn’t recommend Git2, it’s 2 years behind. Thank you! Perhaps I will wait few weeks to see how the SJ7 turns out, but it’s most helpful that you put Git2 out of equation – it was high on my list, but mostly based on older reviews. Also saving money by not choosing Yi2 is nice, as stabilization is definitely my no 1 priority. Hi, does the t5e really supports external mic? Looking for a cheaper action cam than the Gopro. Yi 4k is still a bit much for me to spend. Was considering thieye T5 but then came across andoer c5. Both of these are in my price range. which would you recommend between these 2 or is there another in this range I should be considering? Thanks in advance. Hi, I would recommend Thieye or Andoer AN7000. C5 has some bug, while AN7000 works well (I tested both). Andoer AN7000 and Thieye t5e are exactly the same (chipset, sensor, bluetooth) but in my opinion an7000 has a better stabilizer. Thank you for this very enlightning article! I am looking for a good all-around camera for photo (mostly) and video. Could you help me make the right choice? Perhaps most important, does the AN7000 have a way to correct distortion due to the wide angle lens, like the SJ6 does? Hi, consider also AN7000, identical to T5e but probably more stable. t5e/an7000 have a better video quality, sj6 have a better stabilization. It’s your choice 😀 I would buy t5e/an7000, but for example if you use it only on bicycle, sj6 would be a better choice. So which one, except the gopro’s is the best? In my opinion Yi 4k (plus and normal) and then SJ7. I didn’t test Garmin virb 30 but i think this is very good, and also Sony X3000. An7000 vs T5E vs yi (not 4k) vs git2? Hi, I prefer Yi 4k, and then Firefly 8s. I prefer yi 4k for the touchscreen, Firefly 8s for price. As for video quality they’re almost the same. Hi, I’m considering buying the SJ7 Star only because of the adjustable wide angle lens setting, any idea how good is this feature? Also I’ve seen some youtubes recorded with it but I see much of a fisheye effect and lots of shaking, despite they advertise distortion correction and stabilization, in your opinion is this due to an old firmware which they fixed in newer ones? One last general question Electronic or Gyro stabilization?